Great location and very friendly, helpful stuff. Great stay! Staff were lovely and helpful. Very friendly and helpful staff! Very well located, at walking distance from the Citadel. The staff were so attentive and the breakfast was delicious. The location is good, only 10 minute walk to restaurants and the river. The room was very clean and lots of toiletries. The road was a little loud at night and I had to wear ear plugs. But that is my only complaint. This was our favourite hotel in all of SEA. For the money, the best hotel I've stayed at in Vietnam. Very friendly and helpful staff. Staff was most accommodating and friendly. My only problem was iffy internet connectivity. Great location, 15-20 minute walk into the center of the citadel. On busy street, but relatively quiet. Good breakfast, friendly staff, the staff does want to book for you if possible, which makes you feel a little bad when you book elsewhere for cheaper. 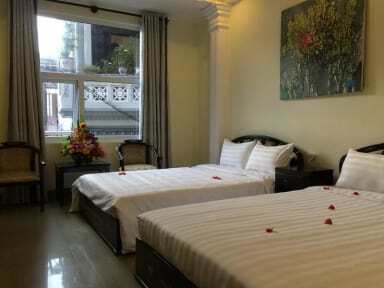 Clean room, comfortable medium to soft beds. Would stay again. Good hotel and nice, friendly staff. The hotel is situated very close to everything. The rooms were fine and clean. Only things: the breakfast could be better and the rooms could be more quiet if the special doors would be shut at all times. The lobby, the stair/hallways are quite noisy but the special doors are only kept shut at night but opened around 7 am-also the door to the loud street. That makes it really hard to sleep longer than until 7 am. We kept closing them, but were reopened. 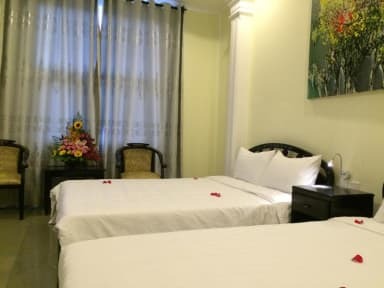 Nice budget hotel in central Hue. It's located on a busy road, but the top floor room we had is fairly well sound insulated. It had great air conditioning and was super clean. Also the staff are extremely helpful and reliable. The interior is actually a lot nicer than the photos suggest. Only problem is the lack of character, compared with some of the hostels we stayed at in Hoi An.